Standing some 2,000 miles west of Chile, on the Easter Island, 887 mysterious giant statues have intrigued scientists and the public for years. For a long time it was believed that the massive statutes consisted of just the heads. However, in October 2011, when the Easter Island Statue Project began its Season V expedition, scientists could reveal remarkable photos showing that the bodies of the statues go far deeper underground than just about anyone had imagined. “We found a round, deep post hole into which the Rapa Nui had inserted a tree trunk,” she said. Van Tilburg said ropes were attached to the tree trunk and to the partially carved statue. 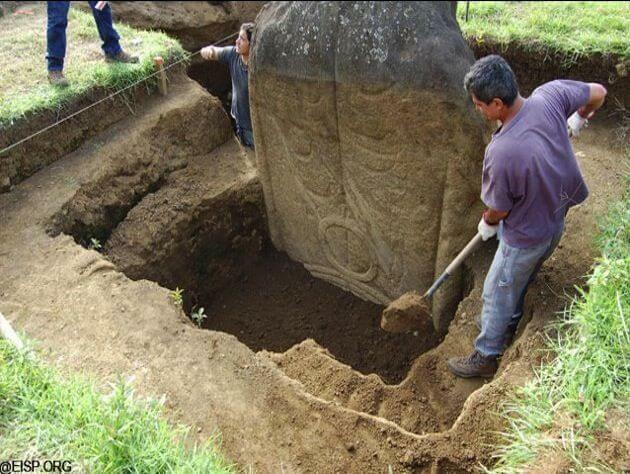 “We found a rope guide that was actually carved into the bedrock near the statue.” The Rapa Nui then used the tree trunk to raise the statue upright. Before the statue was upright, they carved its front. Once it stood erect, they finished the back, Van Tilburg explained. The excavation team also found about 800 grams of natural red pigment — nearly two pounds — in the burial hole, along with a human burial. Van Tilburg believes the pigment was used to paint the statues, just as the Rapa Nui used pigment to paint their bodies for certain ceremonies. The unusually large amount of pigment found indicates that it might have been used by a priest or chief, perhaps as part of mortuary practice, she said. Human bones were found throughout the dig, indicating that people buried their dead around the statues. Hundreds, perhaps thousands, of visitors to the island have been astonished to see that, indeed, Easter Island statues have bodies! On the project website, Van Tilburg said: “We found large quantities of red, some of which may have been used to paint the statues. Finally, and perhaps most poignantly, we found in the pavement under one statue a single stone carved with a crescent symbol said to represent a canoe, or vaka. The backs of both statues are covered with petroglyphs, many of which are also vaka. Still, many of these ancient petroglyphs remain undeciphered and the history of one of the most remote islands in the world is now even more mysterious than ever.